Honor Among Thieves is the second book in the “Empire and Rebellion” series that started with Leia’s book, Razor’s Edge. 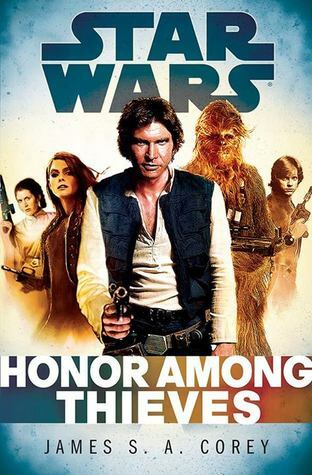 I liked this one, the Han-centered book of the series, much better. These books take place between Star Wars and The Empire Strikes Back. THE PLOT: Han and Chewie are sent to pick up a rebel agent. Sounds simple, but of course it devolves into a complete life-risking debacle. Han is being pursued by an old-smuggler-friend-turned-bounty-hunter who was stupid enough to already spend some of Jabba’s money. No matter what else happens, he HAS to bring Han to Jabba or end up being hunted as well. So of course, picking up the agent, Scarlet, isn’t the easy job it was supposed to be. And obviously, there’s going to be more to it than just bringing her to the Rebellion’s rendezvous point. Turns out the Empire is on the verge of controlling Hyperspace; obviously, that can’t happen. MY TWO CENTS: I was surprised at how short this book was; about 250 printed pages. (I know it lists as 288 pages, but some of that is sample chapters of other books.) Despite that, I didn’t feel like it was too short. Some Star Wars books are just bloated with filler, so this one is pretty much all pertinent to the adventure. I loved how Han questions what the Rebellion’s intentions are…obviously, there will be some sort of government no matter who wins. Does Leia intend for her government to be a better alternative to the Empire, and how, exactly? Again, if you’ve read any of the Expanded Universe books…well, heck, if you’ve seen the rest of the original trilogy…you know our main characters are never in any real danger here, but the authors make it seem suspenseful anyway. That helps make for a good read. I enjoyed the main two “new” characters, Scarlet Hark and Baasen Ray, add good entertainment without messing up continuity. TEACUP RATING: Five out of five cups of tea. I applaud the authors for writing the story and not padding it unnecessarily.